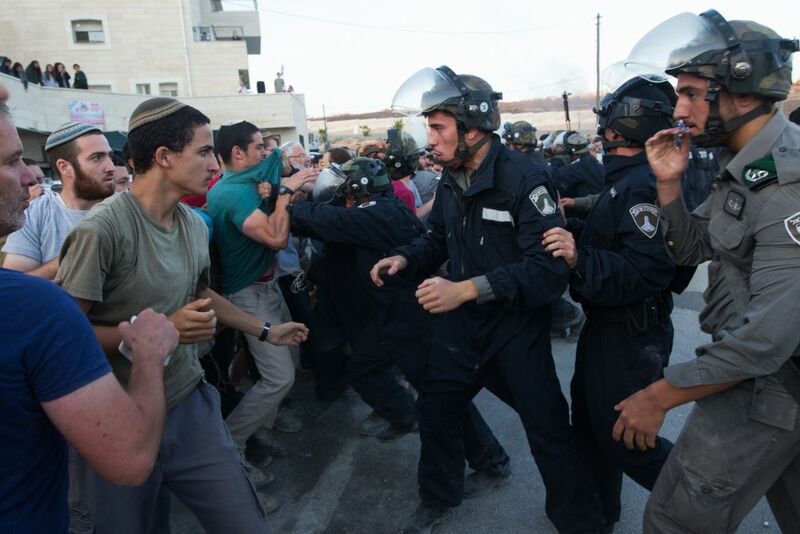 Clashes between settlers and security forces erupted anew Tuesday evening in the West Bank settlement of Beit El, ending a tense calm that had fallen after earlier protests over the evacuation of two illegal structures at the site. Protesters were hurling stones at Border Police officers as hundreds remained gathered at the settlement north of Jerusalem, among them right-wing members of the Knesset, Israeli website Ynet reported. The state on Tuesday afternoon lodged an appeal with the High Court against the demolition of the so-called Dreinoff buildings, reportedly built on private Palestinian land seized by the Israel Defense Forces in the 1970s. 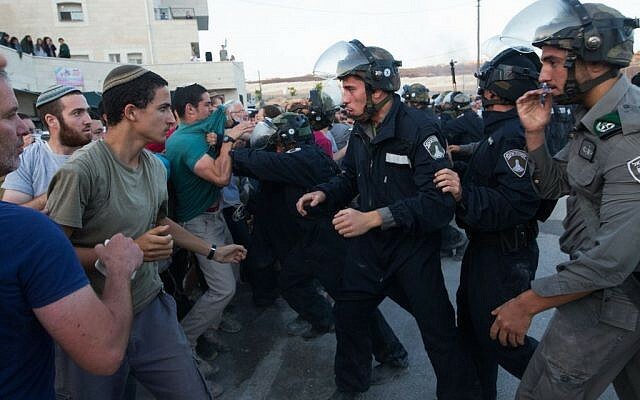 Five people were detained for questioning, as the clashes resumed, Ynet said. Major protests against the planned demolitions were also planned for Tuesday evening in Israel’s main cities, Army Radio reported. Around 50 settler youths had barricaded themselves inside the buildings in an attempt to prevent the implementation of a High Court of Justice ruling to raze the two structures by July 30. They were evacuated by police before dawn. Education Minister Naftali Bennett on Tuesday slammed the “reckless, radical, and redundant” efforts by Israeli authorities to take control of the buildings. “During the night, something reckless, radical, and redundant happened here, an act that does not fit the spirit of the government that we are a part of. 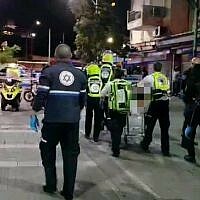 We will not take part,” Bennett told residents of Beit El in an impassioned speech atop a grocery store. “You, my brothers, are continuing this path. We know that the land of Israel is acquired through suffering,” he added. Bennett said he had spoken to Prime Minister Netanyahu early Tuesday morning, demanding that the government send an official notice to the court that it opposes the house demolitions. Bennett had earlier singled out Defense Minister Moshe Ya’alon, blasting his failure “to soothe” the situation. Several other right-wing legislators later echoed Bennett’s stance against the defense minister. But Ya’alon defended his decision Tuesday afternoon, insisting that while he “has and will continue to act on behalf of West Bank settlers,” he will not allow laws to be broken. Moments after the minister concluded his speech, the turmoil resumed as settlers attempted to break into the Dreinoff buildings, violently clashing with police. The IDF said its Border Police unit would hold its position and await orders on how to proceed.